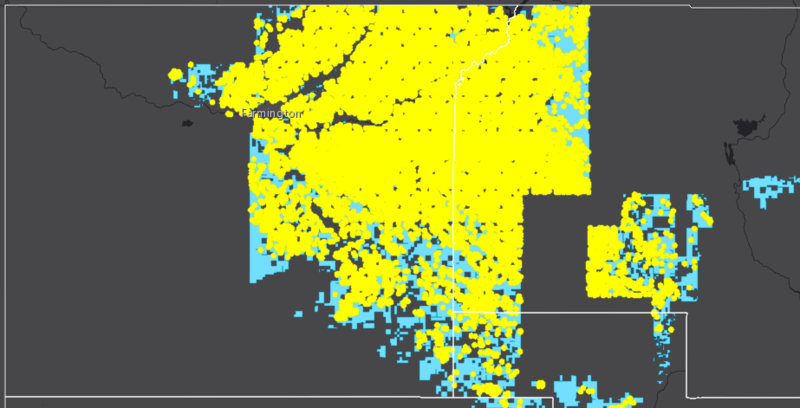 Area threatened by existing oil and gas development (yellow) on top of public lands (blue) in Northwest New Mexico. See oilandgasthreatmap.com for interactive map. 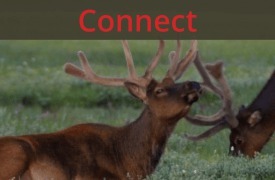 You can’t drive through Northwest New Mexico and Southwest Colorado and miss our region’s oil and gas development. It’s everywhere. This development threatens our public health, accelerates climate change, and degrades our public lands. 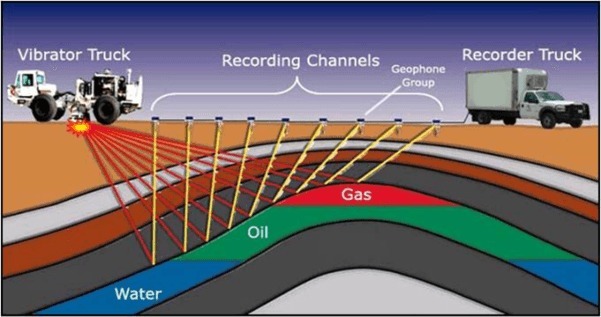 Just this summer, NASA confirmed that oil and gas is responsible for a majority of the methane pollution causing the Four Corners “Methane Hotspot,” the highest concentration of the greenhouse gas in the United States. This methane pollution is a climate disaster. It also endangers us with its co-pollutants: carcinogens, respiratory irritants, neurological threats, and more. 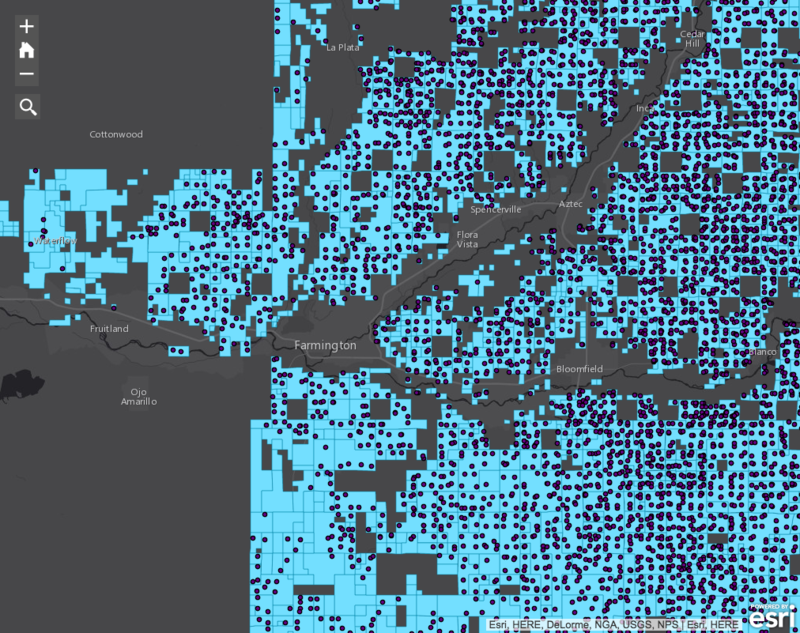 Nearly 48,000 of us live underneath this hotspot. This pollution is happening on our public lands. Did you know that over 91% of public lands, in northwest New Mexico have already been leased to oil and gas development? 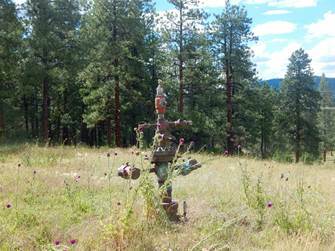 There are over 40,000 wells in the San Juan Basin. 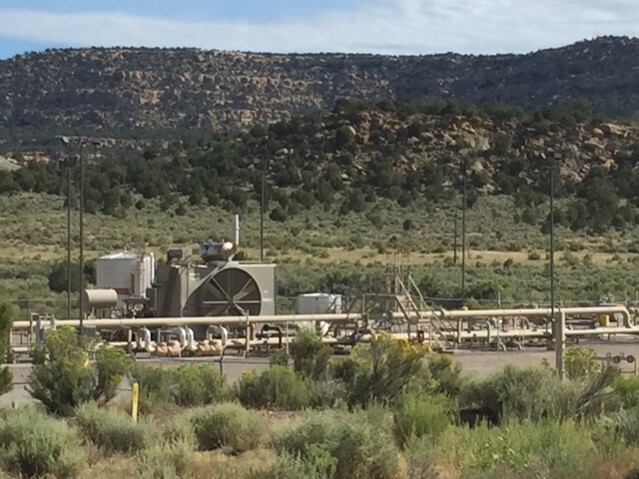 Oil and gas wells on top of public lands in Northwest New Mexico. See oilandgasthreatmap.com for interactive map. 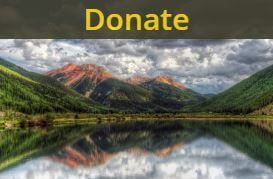 As if that wasn’t enough, now industry is eyeing untouched lands over the border; specifically, a potential 500,000-acres in the San Juan National Forest and 1500 proposed new wells by the Southern Ute Indian Tribe. Meanwhile, 65% of Colorado’s west slope already has air quality below EPA standards due to oil and gas development. These are public lands, lands you and I own, lands where we live and play – and they’re being devastated in ways that threaten our health. Enough is enough, something’s got to give. This first step to change is education. Today the Oil and Gas Threat Map (O&GTM) added a “public lands” layer to its mapping system. 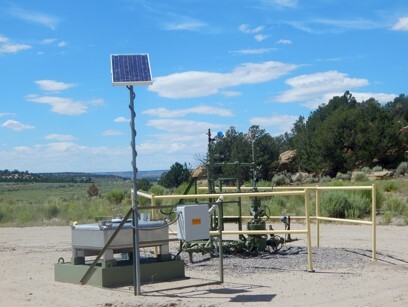 The O&GTM provides innovative ways of understanding the threats that oil and gas pollution from public lands poses to our communities. The second step is to take action. First, sign this letter asking the Bureau of Land Management (BLM) to stop all new leasing in Northwest New Mexico, 91% is enough. Then, submit this letter to the BLM encouraging them to finalize their methane regulations as soon as possible. It’s time to focus on shifting our energy economy. It’s time to prioritize our health and the integrity of our public lands, for ourselves and future generations.